The Icarette (sometimes mistakenly called a Jcarette because of the fancy "I" used) is a very old line of cameras, first produced by ICA before the mergers that formed Zeiss Ikon in 1926. ICA itself was formed in 1909 by an amalgamation of Carl Zeiss Jena and others. My Icarette has a lens serial number of 1089397, a body number of Q***42 and a shutter serial number of 1065884. This means the lens was made towards the beginning of 1930, the body in early 1929 and the shutter in mid 1929. This suggests that this particular Icarette was made in 1930 - 1931 at the latest. The design is fairly old-fashioned for this date - not self-erecting and the focussing is on the baseboard, not the shutter assembly. It does, however, have a rim-set shutter which was very much state of the art for 1930. I also have an earlier Icarette, from around 1919, made by ICA. The Icarette is a thin camera when closed (35mm), but measures 180 mm long by 85 mm wide. This makes it far too big to be a pocket camera. To open the camera, you must press a slight bulge in the leatherette close to the film winder. When opened, the base board has to be brought down to its position by hand - no springs here. Then the lens/shutter has to be pulled forward until it locates on the focussing control. The focussing control is a lever on the side of the base board which moves the shutter a total of less than one cm giving a focussing range from infinity to somewhere around three feet (the nearest marked position is for seven feet but the lever moves beyond this). This camera has two viewfinders - a small brilliant finder and a cruder Newtonian finder with the far frame attached to the lens so movements of the lens are accounted for. I do not find brilliant finders very easy to use but they have the advantage of allowing the camera to be used at waist level - much more discrete for candid or street photography. The lens has a rise and fall mechanism and if you use this, the Newtonian finder is essential. The rise and fall mechanism is there to allow the photographer to photograph tall things like trees and buildings without tilting the camera. This means that there will be less distortion in the final picture. The fact that the camera has a rise and fall mechanism means that the image circle must be much larger than the negative, which in turns means that vignetting will be minimal. As mentioned above, the lens is a Carl Zeiss Jena Tessar lens made in 1930. 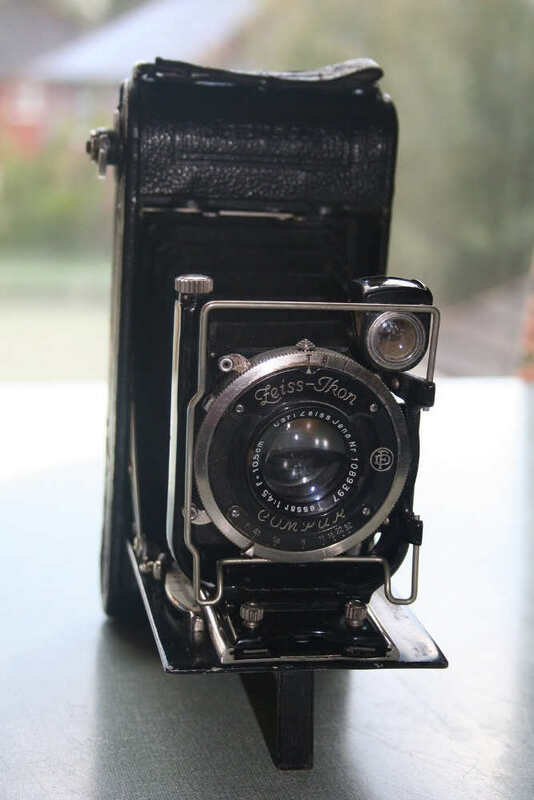 This is the classic Zeiss lens which is still in use today. It has an aperture range from f4.5 to f32 and focusses from around three feet to infinity. The shutter is a Deckel Compur rim-set shutter made in 1929 with speeds of 1 second, 1/2, 1/5, 1/10, 1/25, 1/50, 1/100 and 1/250 seconds as well as B and T (B keeps the shutter open while the shutter release is depressed, T keeps the shutter open until the shutter release is pressed again). The shutter also has a self-timer but as the general advice is not to use these on old cameras, I do not know how long the delay is. I would suspect around ten seconds. This shutter is the crème de la crème of shutters and still works well over eighty years after it left the factory. The camera is fitted with two tripod bosses - one the base board close to the hinge and one part way along one of the edges. Both are 3/8 Whitworth threads with a 1/4 Whitworth insert - the insert being held securely in place by a grub screw. With my sample of this camera, someone has tried to remove the 1/4 inch insert without removing the grub screw damaging both the insert and the grub screw - they did this to both tripod bosses. However, both still fit my modern tripod and hold the camera securely. This camera takes 120 size film (or BII as Zeiss call it). The spool carriers are hinged which allows easier loading of new film (and removal of exposed film). These are fairly soft. This is partly because focussing is inaccurate - the entire lens standard moves on a track and the distance between one metre and infinity is very small. helical focussing which became the norm soon after this camera was made gives more control. Partly it is soft because it did not matter. Photographs were normally printed as contact prints so the picture would have been 6cm by 9cm (a bit smaller than I have them here). I am trying to fix mine as it won't slide out on the track. Any suggestions?